Meet the gaur—the biggest wild cattle in the world | Where to next? I have to confess that I’d never heard of gaur until after I’d seen lots of them. Anand and Deepti kept talking about all the bison we’d see on our game safaris, and sure enough we saw plenty in Pench and Kanha national parks. But when we checked out the visitor’s centre at Pench, I learned that Indian bisons—the largest wild cattle in the world—are also known as gaur. A full-grown bull can measure up to 330 centimetres in length (almost 11 feet) and 1500 kilograms (3300 pounds) in weight. Only elephants, rhinos, hippos and giraffes consistently grow heavier. 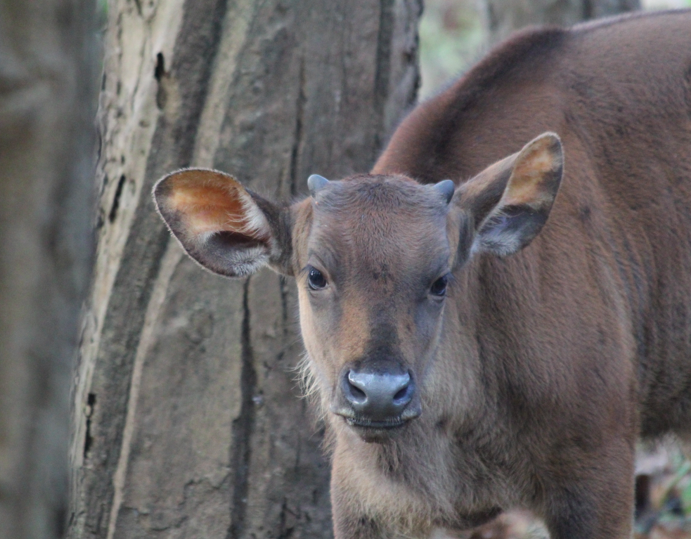 We saw gaur grazing, mostly solo, but in Kanha we saw a family herd of about 15 animals including some younger members. The smallest calf was quite curious and approached our vehicle cautiously, with eyes wide. The adults didn’t show much interest, but if a tiger (their main predator) were to stalk the herd, the adults would form a circle around the young. There are even cases in which a gaur have managed to gore and trample a tiger to death. Surprisingly, gaur are fairly agile for their size and weight. They prefer hilly terrain with evergreen and/or moist deciduous forests. 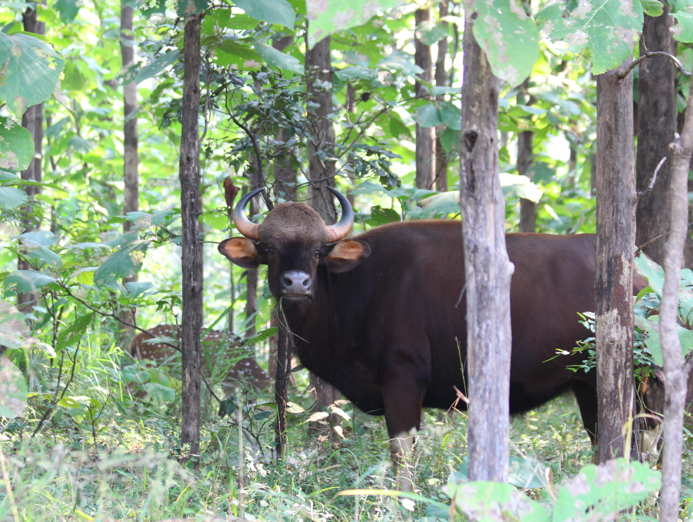 In addition to grasses, gaur eat leaves, shoots, bamboo, shrubs, trees and bark. But apparently they won’t touch areas that have been affected by forest fires. Gaur have been listed as a vulnerable species since 1986, with about 70 per cent of their population depleted in the last three generations. Populations are stable in well-protected areas such as Kanha and Pench, which has about 700. Thanks Derrick, the trip is going very well. And yes, I thought the American bison was the biggie. Guess there’s big and BIG. The calf is so beautiful and I was amazed that it was so curious. Still surprised, too, that the adults were confident to let the calf approach us. Wow! They’re certainly very huge but the calf is beautiful. I was interested to read that, when threatened by a predator, the adults circle around the young. I was watching a program called Nordic Wild on SBS last night and there was one element about a family of owls—I’m pretty sure that’s not the correct collective noun. Anyway, the youngest baby was much smaller than its siblings and the mother fed it last; all the time. Talk about survival of the fittest. Thanks again for the good photos. Hi Louise, I just happen to know that the collective noun for owls is Parliament—so a Parliament of Owls. Also, Anand and Deepti say that for many of the birds here, if two eggs hatch, the parents generally feed only the stronger one unless food is truly plentiful. Mother Nature and Natural Selection at work! G’day and thanks Peggy for always learning something new through you! GREAT photos as always that brighten my day too! My pleasure, Joanne. Stay tuned for the jackals. I’ve talked to few people who have seen gaurs at Kaeng Krachan National Park in Thailand, I’ve been there twice but wasn’t that lucky. Next time gadget, next time.